The Lusophone Scouts Group of Macau is being run on a interim basis by one of its founders ever since its former head left, but the departure of André Gonçalves didn’t compromise the work being made by the organization. Known as GELMac (Grupo de Escuteiros Lusófonos de Macau) the group has been involved in a fair share of activities in the last couple of months and plans to take part in the largest regular event organized by the Scout Movement. The World Jamboree 24th edition will be held in West Virginia, by the end of July. Without a leadership, but not necessarily without a direction. The helm of the Lusophone Scouts Group of Macau (GELMac) has been handed over to Celeste Costa since the end of 2018 and a new board of directors should only be elected by the end of the year, but the departure of former head André Gonçalves did not jeopardize the dynamics of the organization. In the last three months, the Lusophone Scouts have explored the trails of Coloane, paid a visit to Kadoorie Farm and Botanical Gardens, in Hong Kong, walked some of the greyhounds that are under the care of ANIMA, joined hands to repair and renovate GELMac’s headquarters and until the end of the year there are several high-profile initiatives in which the group should be involved in. The return to Hong Kong Special Administrative Region is already scheduled, as an appetizer for something bigger, the participation in the 24th World Jamboree, the single largest regular event organized by the international Scout Movement: “We will organize a new activity in Hong Kong, this time at the Wetland Park, in Lantau. Next month, Coloane will host this year’s edition of ACAGRU, GELMac’s pre-summer camp and in May our Pioneers will set camp in Hong Kong,” Celeste Costa explains. “In July, the 24th World Jamboree will be held in the United States of America. It is an event that takes place every four years and one in which GELMac has been participating ever since 1998,” the interim head of Macau’s Catholic scout movement points out. The Lusophone Scouts Group of Macau – one of three diaspora collectives affiliated with “Corpo Nacional de Escutas” (CNE), the Portuguese National Boy Scouts Association – made its debut in World Jamborees in 1998, less than a year after it was founded and the tradition started in Chile (the 19th World Jamboree took place between December 27, 1998 and January 6, 1999 at the foot of the Andes, about 40 miles north of Santiago) is due to be continued, notwithstanding the almost unbearable costs associated with the expenses required to travel to the United States of America: “It is far and expensive, but it is also a unique opportunity for our boys and girls to take part in one of the world’s biggest events. We will do our best, so that a small group of Pioneers can be there to represent Macau and GELMac,” Celeste Costa says. Affiliated with Portugal’s National Scout Movement, GELMAc has an undeniably Portuguese Matrix, but in a plural place like Macau, CNE’s Group 341 was never exclusively Lusophone. Among the 35 boys and girls that currently belong to the various sections of the group are children of at least six nationalities: “The group currently has 35 scouts, among whom are Portuguese, Chinese, Macanese, Brazilians, Cape Verdeans, Filipinos and even a young girl from Mongolia,” said the interim head of the organization. “Nowadays, all sections – Cub Scouts, Explorers and Pioneers – have an adult as Head of Section and other adults who volunteer when help is needed. We are talking about a dozen adults with supervision roles,” adds Celeste Costa. Despite the multicultural nature of the Lusophone Scouts Groups of Macau, Portugal and the Portuguese National Scouts Association are still the group’s main reference in terms of training and scouting practices. 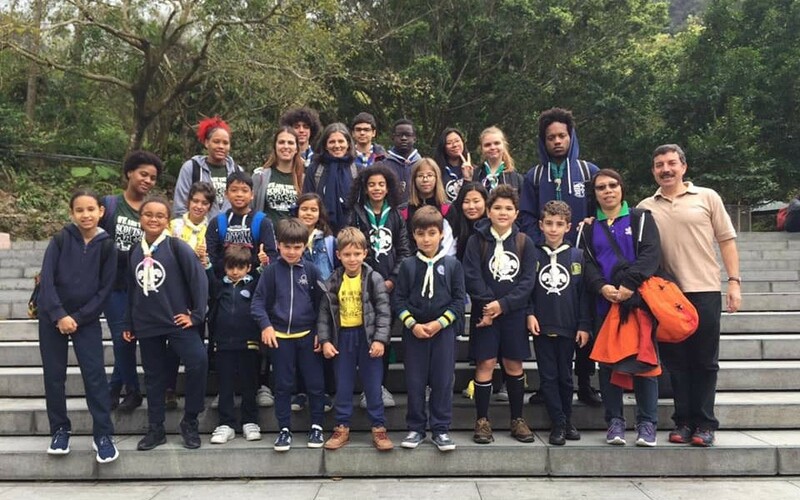 The relationship with CNE, says Mrs Costa, “is the best” and the warm way in which the Macau Special Administrative Region scouts are welcomed whenever they take part in events in Portugal could hardly be more rewarding: “The relationship we have with Corpo Nacional de Escutas is the best. The CNE leadership has always shown availability to collaborate with us when such collaboration is requested, namely in terms of training,” GELMac’s interim head illustrates. “Our scouts regularly take part in CNE’s national camps, which are held every three years. It is an opportunity for our members to establish closer relations with other Portuguese groups, at the same time that they acquire a deeper knowledge about the scout practices of the other groups. Participation allows us to align our activities with what is being done by CNE,” Celeste Costa explains. Founded in 1997, two years before the return of Macau to Chinese sovereignty, the Lusophone Scouts Group is the only Portuguese inspired youth group headquartered in Macau and it has been recognized by the local Government as a public utility entity. Over the last 22 years, the Group managed to keep its activities uninterrupted, despite a constant need for renewal: “I would say that GELMac is facing a problem that is specific to Macau and another that is common to other scout groups,” elaborates Celeste Costa, on the challenges that GELMac faces. “Most of our members are young people who go abroad to study when they finish high school and this confronts the Group with a problem of continuity. GELMac loses a significant number of its most experienced members year after year and this phenomenon requires a constant renewal effort. Another challenge, common to most of the scout groups, is the lack of adults generous enough to collaborate with the project,” the veteran leader says. A founder of the Group in the late 1990s, Celeste Costa is available to continue to give her contribution to the Lusophone Scouts Group of Macau, but says, nevertheless, that she will only be a candidate to the leadership of GELMac if there are no alternatives. For the interim head, the only way to guarantee the survival of the Catholic scout movement in Macau is through the mobilization of new blood: “It would be good if younger elements showed up to ensure the future of GELMac,” she concludes.